A Western Australian woman has been banned from owning an animal for life after being found guilty of 24 animal cruelty charges. Rosemary Muriel Donovan, 24, was handed the minimum sentence for all 24 charges; $48,000 and ordered to pay more than $2700 in vet bills for the animals confiscated from the family property in Mandurah in July 2011. Her mother Kim, who was acquitted of 24 charges, now faces the proposition of having no animals at her home or asking Rosemary, her full-time carer, to move out. 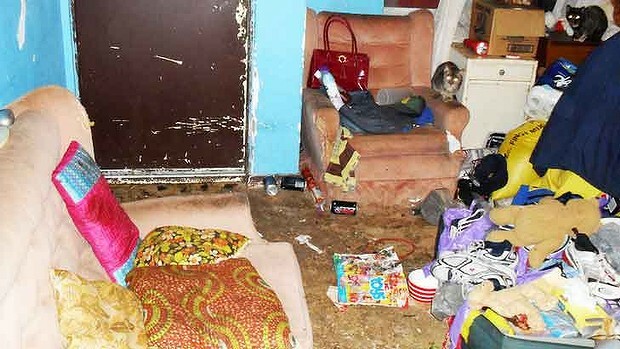 Conditions inside Rosemary Donovan’s house. It was argued that by imposing a permanent prohibition on Ms Donovan, her mother Kim who suffer the same fate. But it was established Ms Donovan’s mother Kim faced the prospect of lengthy hospital stays and that it would then be Ms Donovan that would be left to care for any animals in her mother’s absence. Magistrate Vivien Edwards said evidence showed Ms Donovan had a “total disregard” for all animals found at her property and that she failed to comply with instructions from the RSPCA. 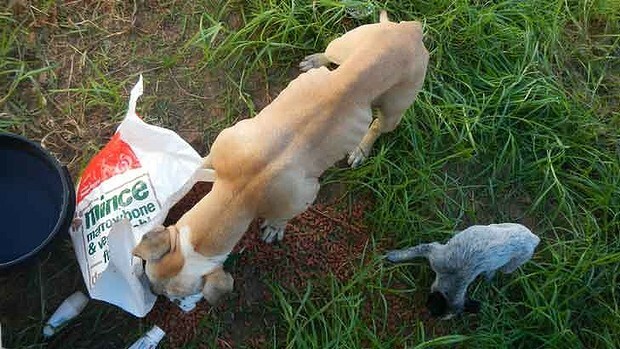 Two emaciated dogs at Ms Donovan’s property. Counsel for Ms Donovan argued that it was not an “active neglect” but rather Ms Donovan had been busy at Royal Perth Hospital with her mother when the RSPCA inspected the property. But RSPCA lawyers argued the animals found at the property had suffered for a prolonged period of time and that Ms Donovan could have taken steps the alleviate the animals’ suffering. The court heard a rabbit found at the Donovans Coodanup property had swelling to its face, causing a discharge from the nose that would have been apparent for months. That rabbit was later euthanised. Another rabbit found at the home had wounds that required extensive surgery before the animal later died. Some guinea pigs at the property were found walking over decomposed animal bodies in their cages. Magistrate Edwards said given the evidence put forward, it could not be accepted that the animals suffered as a result of a single hospital stay when the property was inspected. Magistrate Edwards said despite Ms Donovan showing no remorse, her actions fell “marginally short” of a term of imprisonment. Given Ms Donovan had been unable to work since the age of 14 and is currently on a carer’s pension for her mother, Magistrate Edwards fined Ms Donovan the minimum penalty for each of the 24 charges. An order was made for all animals at the family’s Coodanup property to be removed by RSPCA inspectors in seven days. Ms Donovan will also have her property inspected by the RSPCA randomly every three months and an order was made for any animal found at the property to be confiscated. Outside court RSPCA spokesperson Tim Mayne said he was happy Ms Donovan had been banned from owning an animal for life. He thanked his inspectors and team for their work in the case.